Longer spans of sunlight our in our immediate future, as today marks the shortest daylight day of the year. Tonight's longest night will be brightened by a full moon. Winter officially arrives at 4:21 pm CST. So celebrate the arrival of our shortest day since that means longer stretches of daylight start tomorrow. The increase does start slowly, only one additional second tomorrow, but that will accelerate going forward. 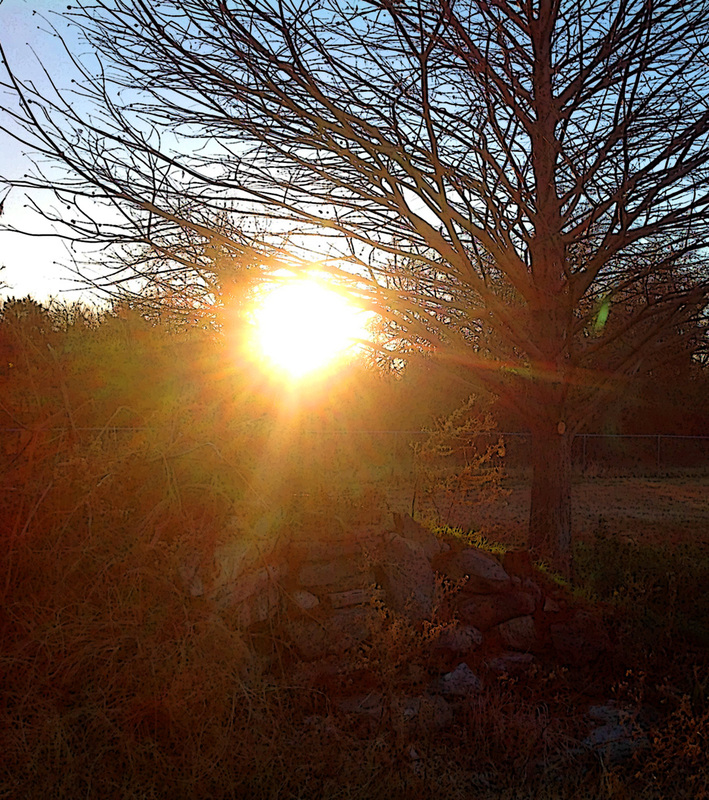 We were rewarded with clear skies and a bright sunrise to greet today's Winter Solstice as you can see in this picture I took this morning. Please note, I DID NOT look through a camera lens to get the shot. I aimed my ipad in the general direction of the sunrise. I did have to take several photos since I could not frame the shot directly. And yes, I did some photographic art manipulation to the image to help capture the glorious way this sunrise on this shortest day of the year made me feel. Cheers to sunshine. Brick and mortar appearances are rare for my creations, so please take the opportunity to check them out in person at the Happy Holidays Pop-Up Market that begins this Saturday, December 8. Joining me will be 14 additional artisans with a wide variety of goodies for the people on your gift giving list or a treat for yourself. 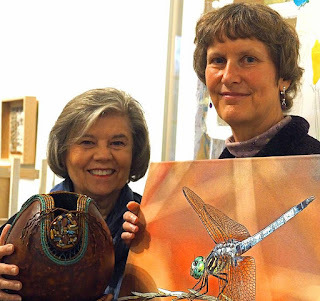 Another one of the artists, a weaver of baskets and related objects, is in this photo with me that O.K. Carter took for his article in the Fort Worth Business Press discussing the business side of art. Happy Holidays Pop-Up Market is an ephemeral boutique shop stocked with unique products produced locally. Don't delay your visit to the Urban Union area of Downtown Arlington. 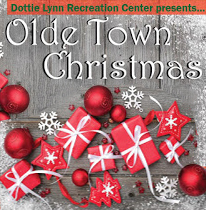 The market will only be open from December 8 through December 23, 2018. See the market website for shop hours and more information about the participating artisans and their wares. While Shop Small Saturday is the Saturday after Thanksgiving, American Express urges you to shop small whenever you can. Whether you're looking for the perfect gift or a little something for yourself, you're always welcome to Shop Small® at the Happy Holidays Pop-Up Market this holiday season. 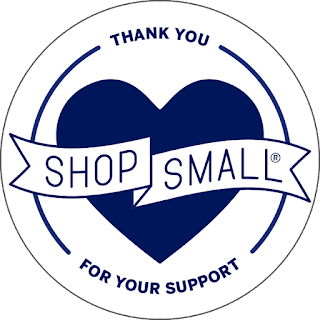 Grab a friend or family member and join the Shop Small Movement, proudly backed by American Express. 817ArtsAlliance partnered with Downtown Arlington Management Corporation to bring about Happy Holidays Pop-Up Market in order to showcase and support local talent and provide a unique shopping experience in Downtown Arlington. 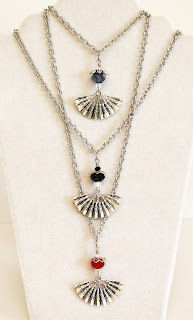 to help me create jewelry for their gift shop to complement the museum's exhibit. These are small batch, handmade items so if you see something you like you need to grab it before it is gone. I purchased some of the supplies in a very limited quantity. The necklaces are made from gold or silver plated brass ginko leaf charms. 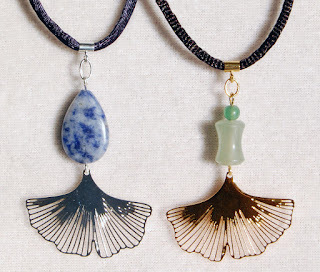 I paired the silver ginko leaf with a sodalite teardrop which reminded me of some blue and white Japanese vases I have seen. I added a silver plated sliding bail to a navy blue silken cord to hang the pendant from. Jade seemed like a natural to pair with the gold plated ginko leaf pendant, which I hung from a gold plated traveling bail on a black silken cord. Cranes and fans are also popular Japanese motifs. You may recall that I used these fan charms to craft an artistic interpretation of the some of the dresses on display during the film costume exhibit this past summer. 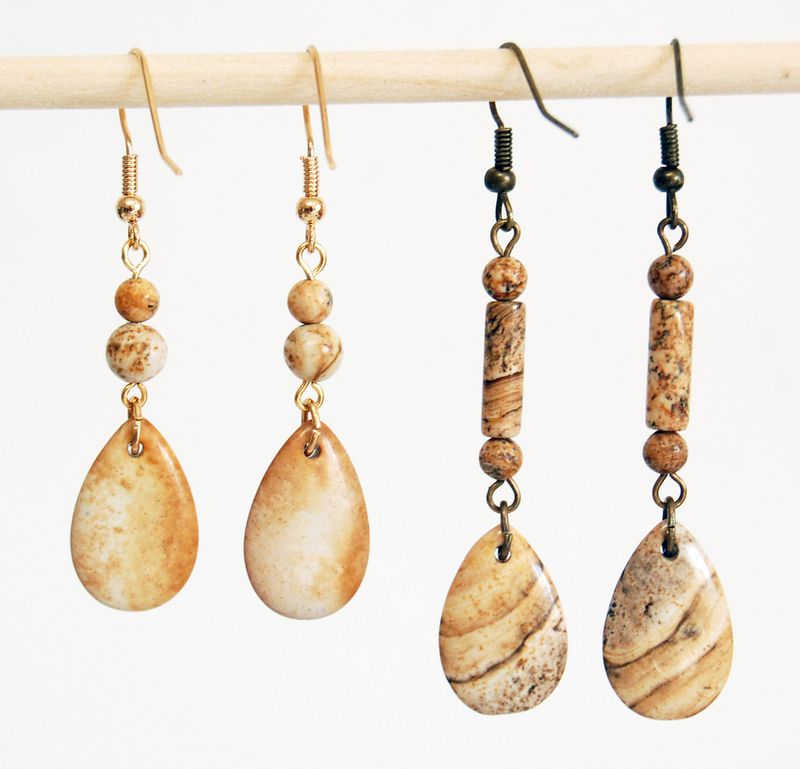 This time I used them for what they are, fans, and paired them with jade beads to make fairly large dangle earrings. The hourglass jade beads remind me of sections of bamboo. I made smaller dangle earrings from some crane charms that I recently picked up. I paired them with peacock colored synthetic hematite, rounded bicone beads. Stop by the gift shop to see these and other Japanese themed items when you visit the Hiroshige exhibit at the Arlington Museum of Art. 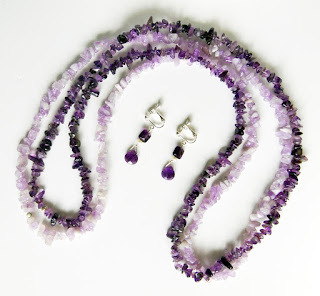 After putting on my dark amethyst colored sweater and accessorizing it with a light and dark amethyst chip necklace a couple of days ago like I often do, I looked in the mirror and once again wished I had a pair of amethyst earrings to go with this outfit. I looked at my clock and had some time before I needed to leave for my meeting, so I decided to do something about that wish. rings to turn them into dangles. I decided I wanted longer earrings than just that dangle however so I picked out a pair of faceted square amethyst beads too. I decided the design still needed a pop of something else. Instead of using a small, lighter colored amethyst bead with the dark square ones, I picked out a pair of small pearls. I liked their shape and color contrast better in the overall design. Now that I had the design complete, I had just enough time to put it all together and wear my new earrings to my meeting. 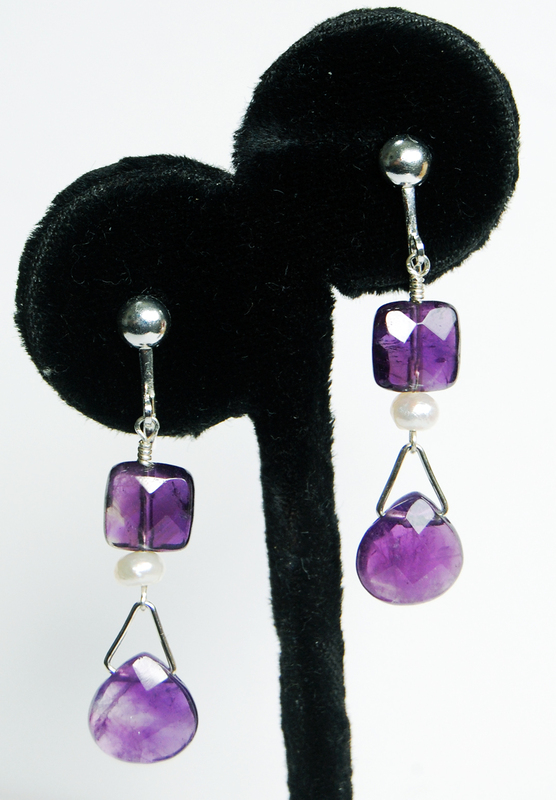 My amethyst and pearl earrings are a welcome addition to my jewelry collection. 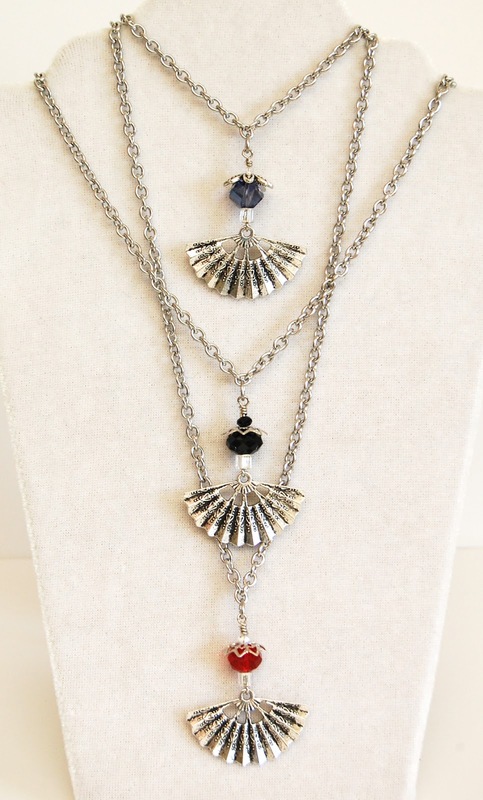 Do you have a wish to match an outfit or other jewelry component of yours? I might just have the right supplies to help you out. 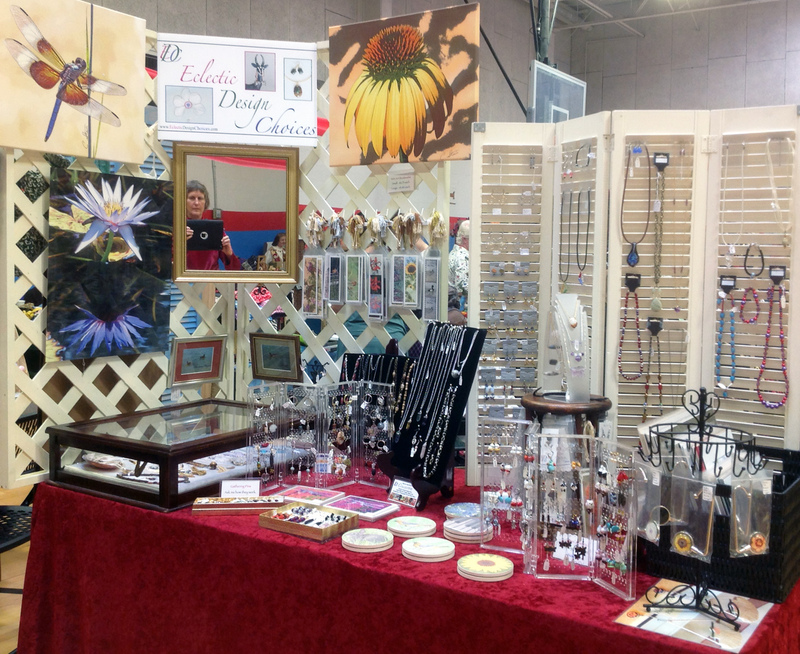 Contact me to discuss custom earrings, necklaces or bracelets to fit your needs. 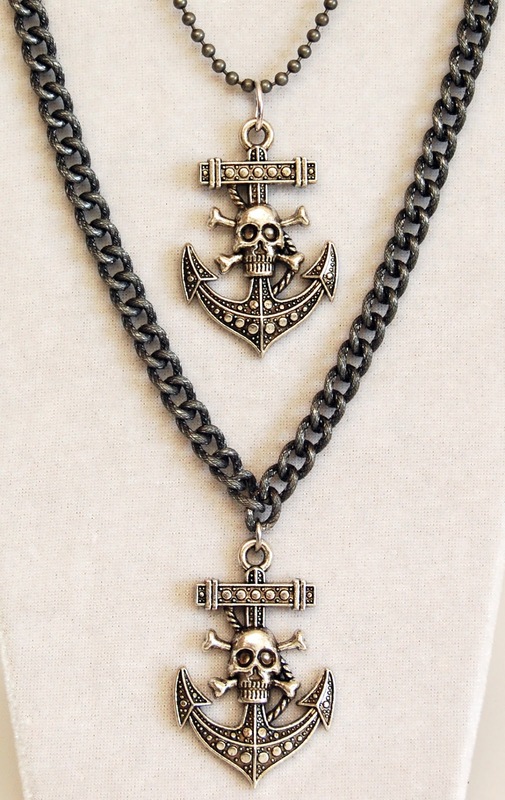 My EclecticSkeptic Etsy shop has a new science jewelry listing. Space buffs will appreciate the new planet and star earrings. 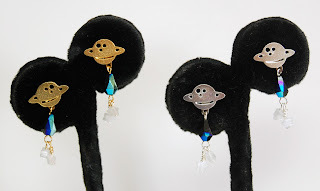 I discovered some cute, plated brass, ringed planet earrings. I made dangles for them to expand on the celestial theme. The first joint of the dangle is a dark blue teardrop shaped Czech glass bead with a pop of AB coating that represents the fabric of space. Below this bead I attached two separate small white star dangles. Check out these and other science themed jewelry and gifts in my EclecticSkeptic science geekery shop section. 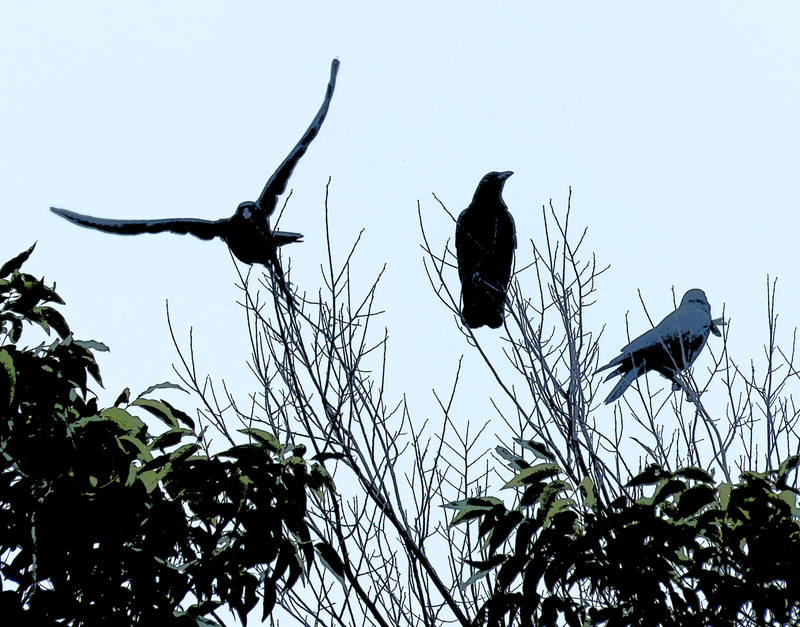 A few weeks ago I saw the biggest gathering of crows that I have ever seen. 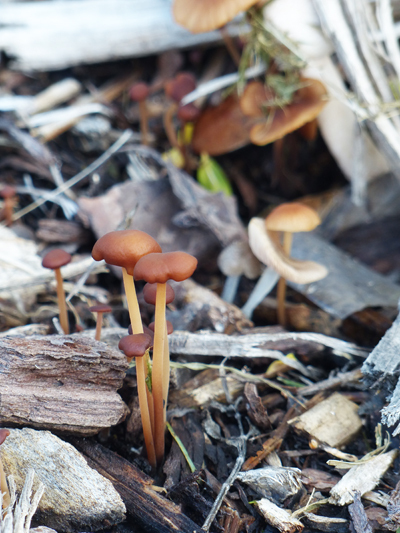 (The photo above captured just over half of them.) 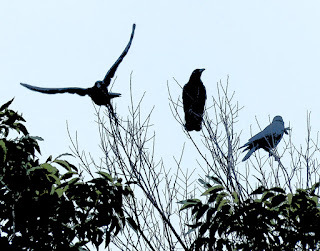 I am used to seeing murders of crows of six to twelve in my backyard, but to see two dozen in a single group was quite an experience. Crows are loud birds and in this group they were constantly communicating. Sometimes they would all hang out in the tall pine trees just off the corner of my pasture. 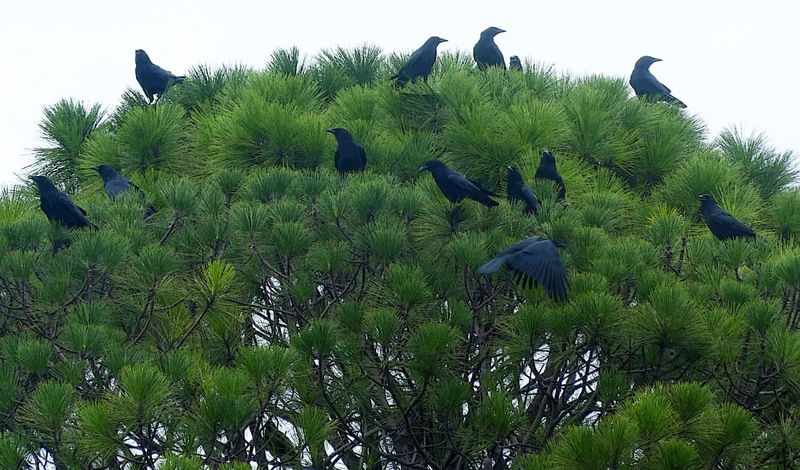 Then some of them would fly to nearby treetops before returning to the big pines. 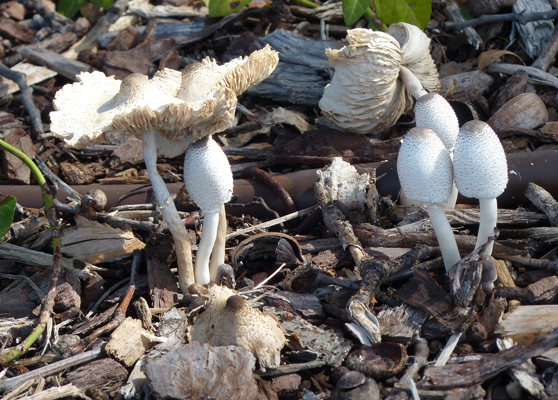 Eventually something signaled to them and they all flew off and out of site. Calm and quiet returned upon their departure. 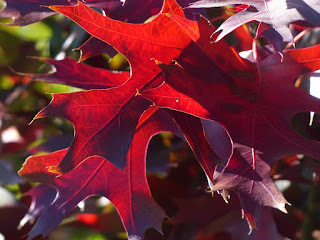 I have written several blog posts about monarch butterflies and have pictured queen butterflies in a couple of posts. (You can use the search box at the right to find them.) However I don't think I have discussed monarch butterfly mimics before. 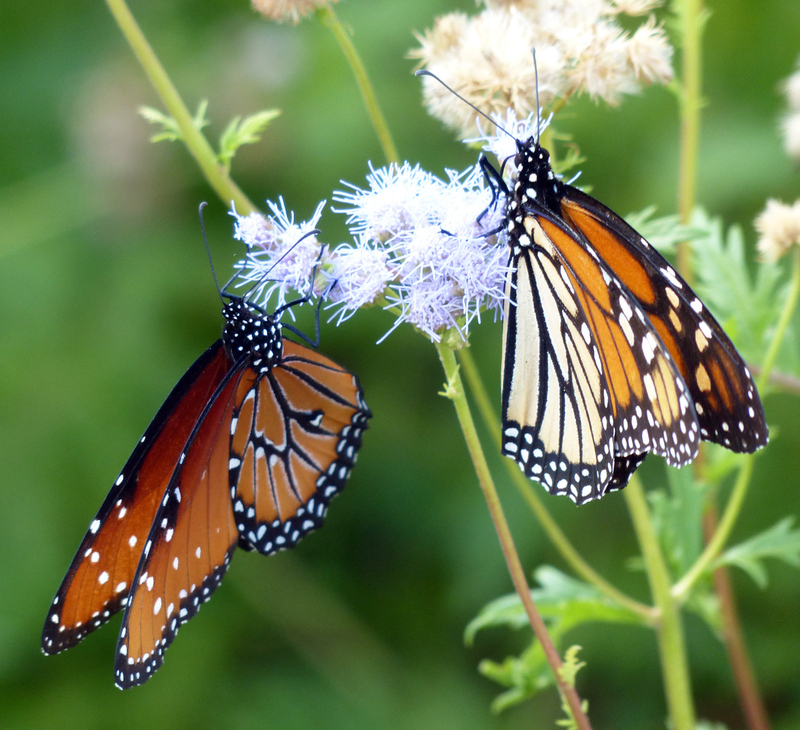 There are two butterfly species that mimic the monarch butterfly. 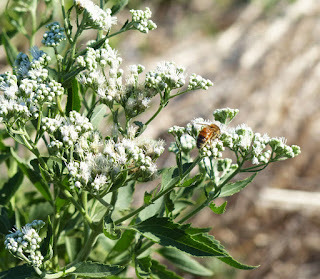 It is thought that doing this affords them some protection from predators since birds generally leave monarch butterflies alone because they taste bad from feeding on milkweed as caterpillars. The two mimics are the viceroy butterfly and the queen butterfly. 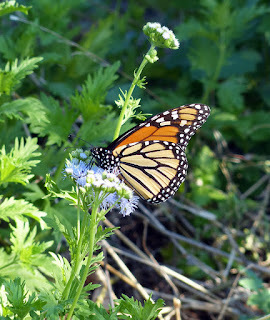 Viceroys are supposed to be in my area but I only recall having seen queen butterflies along with monarch butterflies. You can see one of each feeding on the same blue mist flower in the first photo. The queen butterfly is on the left with the monarch on the right side of the photo. Until this week I did not realize that the queen butterfly caterpillar also mimics the monarch butterfly caterpillar. 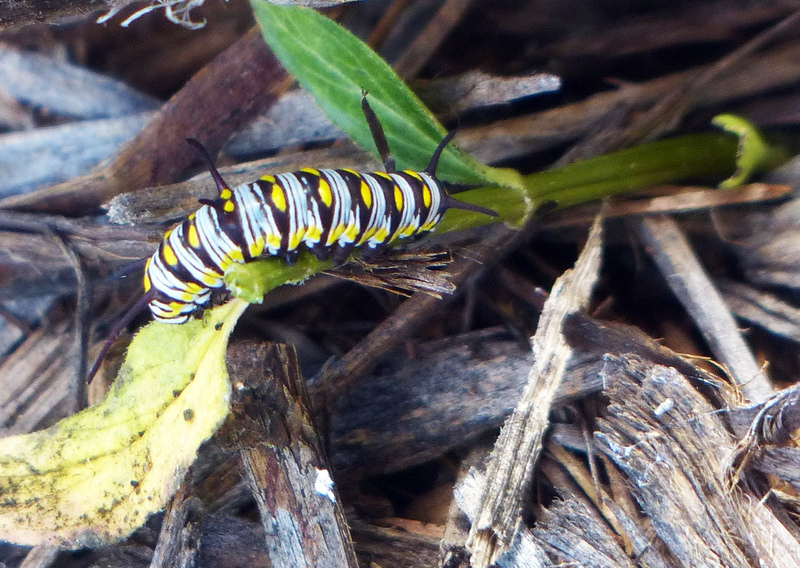 I was excited when I saw a small yellow, black and white banded caterpillar munching on a new milkweed shoot so I grabbed my camera to record it. While I was taking its picture, I was thinking that something seemed a bit off though from what I remembered monarch caterpillars looked like. My hunch was correct when I compared my images to those of monarch caterpillars, so now I had a mystery caterpillar eating milkweed that looked similar to a monarch caterpillar. What was it? I found out that it is a queen caterpillar. Queens have one more set of "horns", three instead of two to be exact, than monarch caterpillars. The monarch's are at each end, while the queen has an extra set near its midsection. 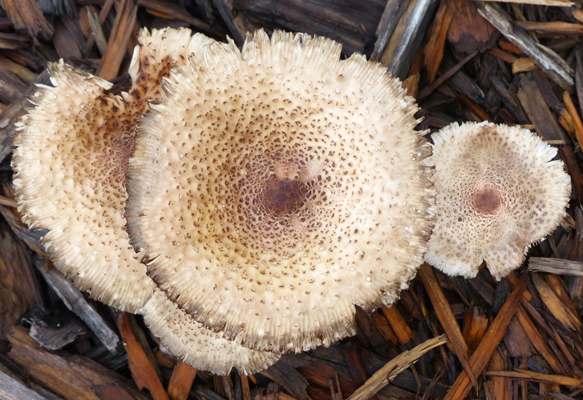 While doing my research I also discovered that their chrysalises are almost identical. 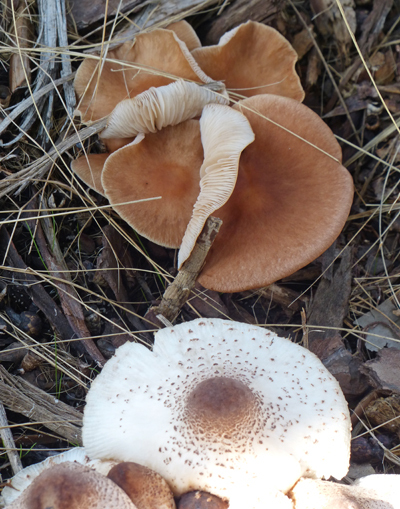 The queen's is a bit smaller and can take on a bit of a pink hue but unless they were side by side, I'm not sure I could ID which one I was looking at. 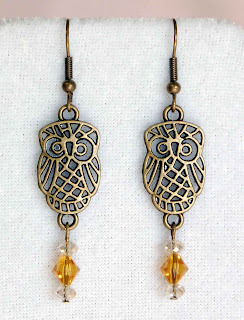 These delightful filigree owl antique brass tone charm earrings are a great fall fashion accessory. 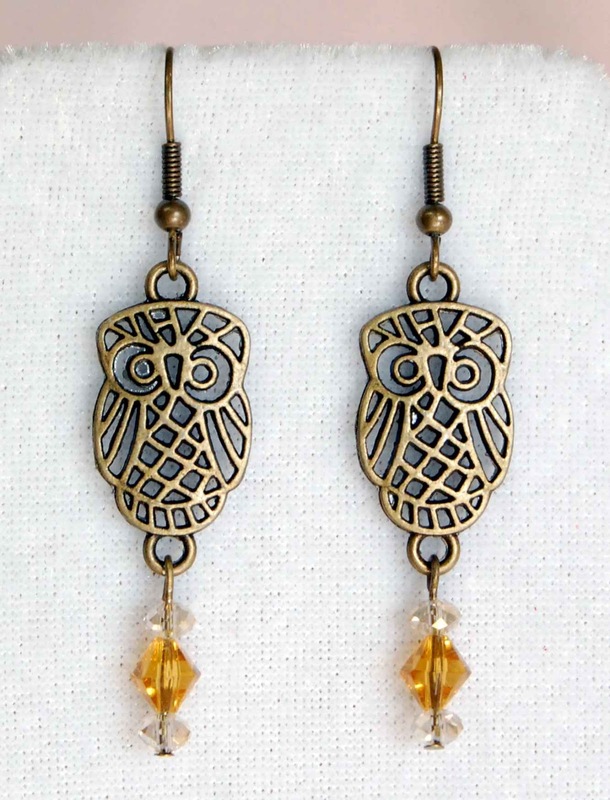 You can personalize them by choosing the color of the central crystal bead of the dangle below the owl charm. 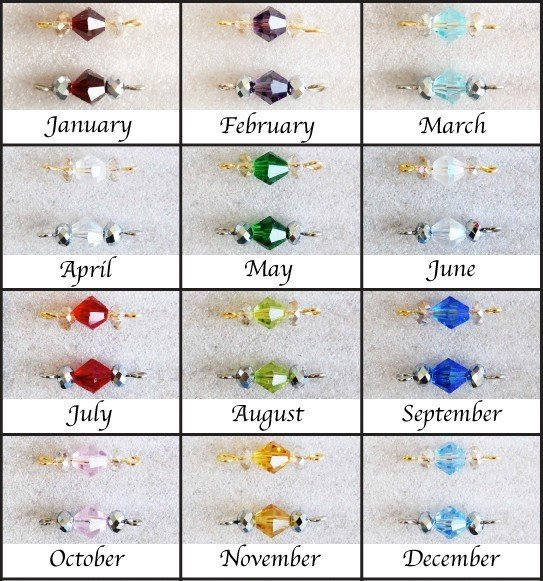 Pick your birthstone, a favorite color or a shade to match a particular outfit. These charming earrings are available in my EDCCollective Etsy shop. The pair of earrings pictured sport the color of November's birthstone, topaz or citrine. 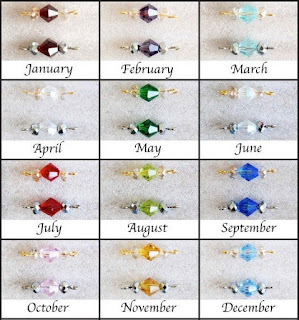 The crystal colors that I use to represent the other months' birthstones are shown in the chart. The dangle will be made with the beads shown on the golden wire. I do have a few additional crystal color choices. Please contact me if you don't see the color you would like to customize your owl earrings with. I delivered my entries to the Uptown Theater in Downtown Grand Prairie earlier today. The foyer of the theater will be home to more than 125 pieces of art from 58 regional artists. It will be open to the public beginning with the reception for the show on Sunday, September 23 from 2-4pm. 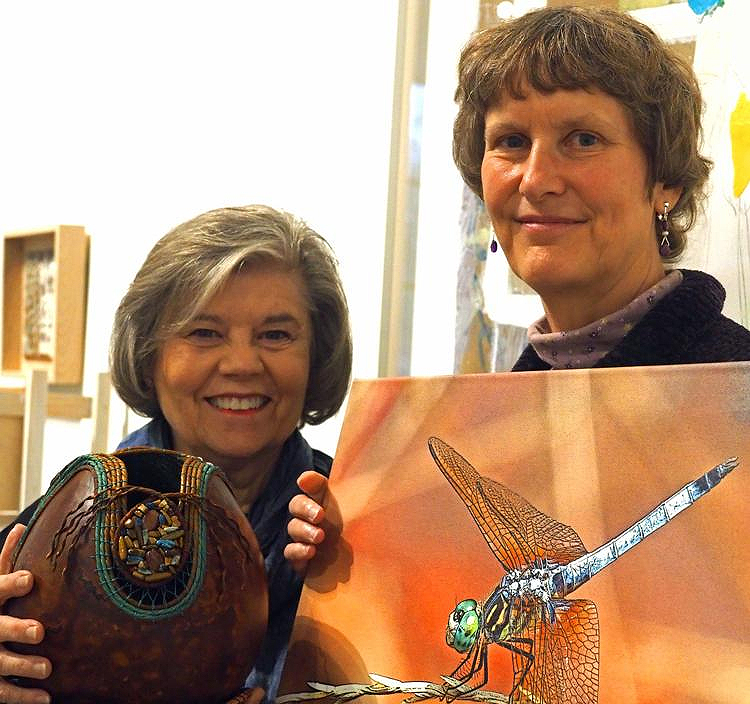 If you are unable to attend the reception for the Grand Prairie Arts Council 2018 Annual Juried Show and Sale, you can view the art in the lobby of the Uptown Theater until the artists remove their work beginning at 10 am Saturday, October 20. My triptych of moonlight on the waters around the Galapagos Islands is one of my three accepted pieces. Update 9/23/18: The piece I shared above won third in the photography category. To see the other pieces I entered, check out my awards tab. North Texas was back into extreme drought until a few of weeks ago when we got a couple of inches or rain. Then this past week my rain gauge has measured over 6 inches of rain, much of that coming in two separate gully washers. 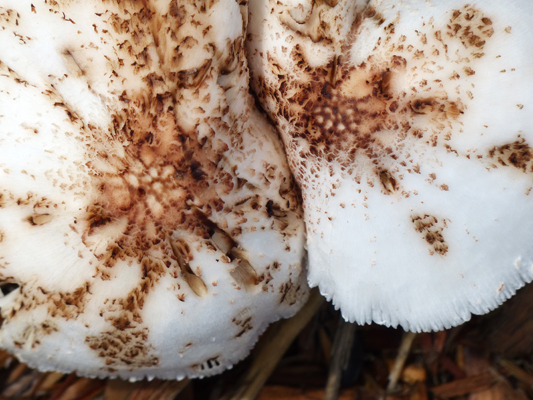 The dormant mushroom mycelium rejoiced and sprung into action. 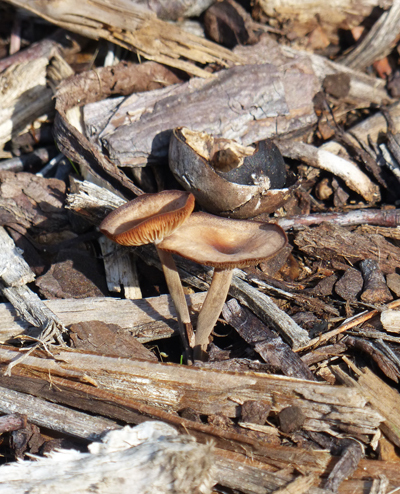 I was amazed at the variety of mushrooms in the mulched beds along Front Street in Downtown Arlington. 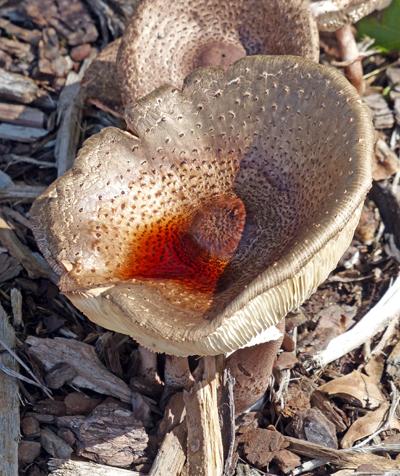 I took a few of the following pictures in my mulched front flower bed. 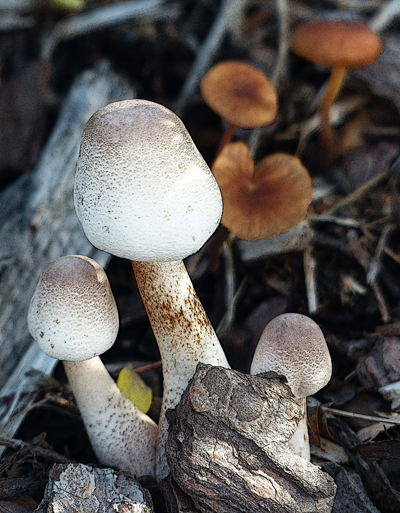 The mushrooms have been quick to grow and produce more spores to release across the landscape to wait for suitable conditions to grow another generation. It is not uncommon for me to go to a trade show and pick up some gemstones in interesting shapes or colors that I am eager to make something out of. Unfortunately the time I have to create never seems to match the number of projects I have grabbed goodies for. This has been true for some teardrop shapes made out of a few different gemstones that I have been meaning to make earrings out of. Fairly recently I finally carved out some time to design two new pair of picture jasper earrings that incorporated some of these teardrops. The first thing I did was to unstring all of the picture jasper teardrops and see what I had that I thought paired up well. I found two pair that I wanted to start with. 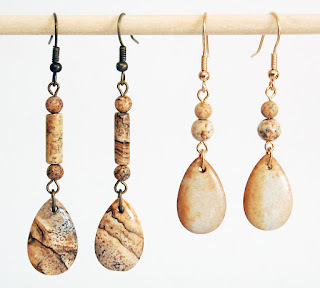 I then pulled out my other picture jasper strands in various shapes and sizes and picked beads that had similar color and character to each teardrop pair. Antiqued brass plated findings complemented the darker teardrops while I thought gold plated findings worked better with the lighter colored ones. 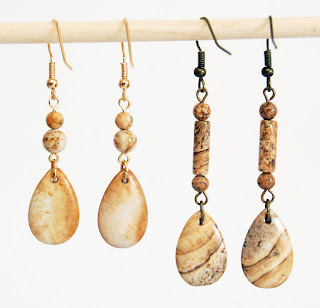 I made jointed dangle earrings out of each matched pair of teardrop picture jasper beads. They are currently listed in my EDCCollective Etsy shop in my earrings section. Yesterday (Saturday, Sept. 1, 2018) I saw my first monarch butterfly of the fall migration. My blue mistflower had recently started to bloom and that is what the monarch landed on. It stayed around drinking nectar for some time. It is amazing how a butterfly that covers so much territory can find and fuel up on a small backyard planting. Don't feel that you can't contribute to helping save these beautiful orange and black butterflies. A few monarch friendly plants tucked into your garden will make a difference. 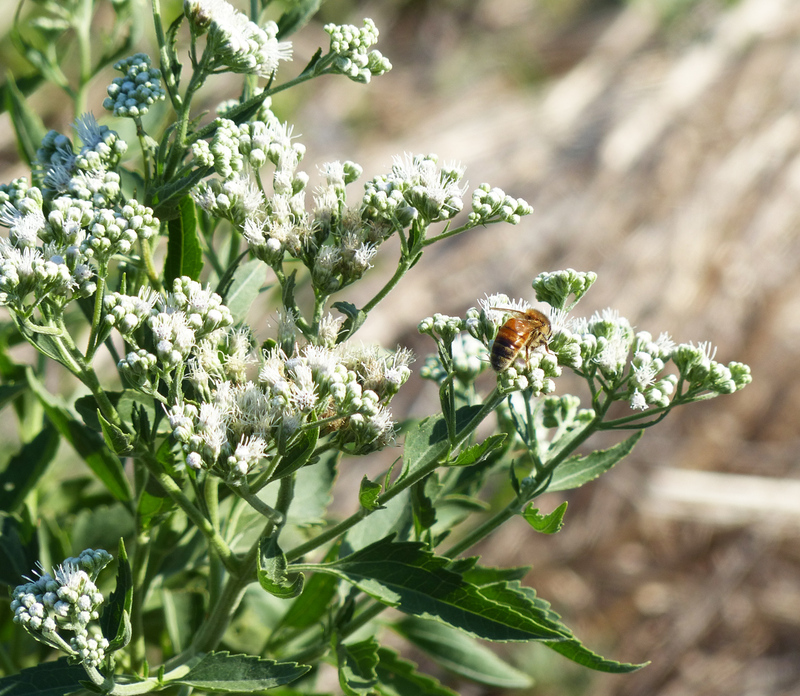 seem to have a preference for it over the boneset. This first fall migrator definitely did and got its fill on the mistflower before heading on its way. I have taken some nice pictures of monarchs feeding on late flowering boneset as well as lantana and small sunflowers so don't feel you are restricted to one plant to create a fueling station for these butterflies. 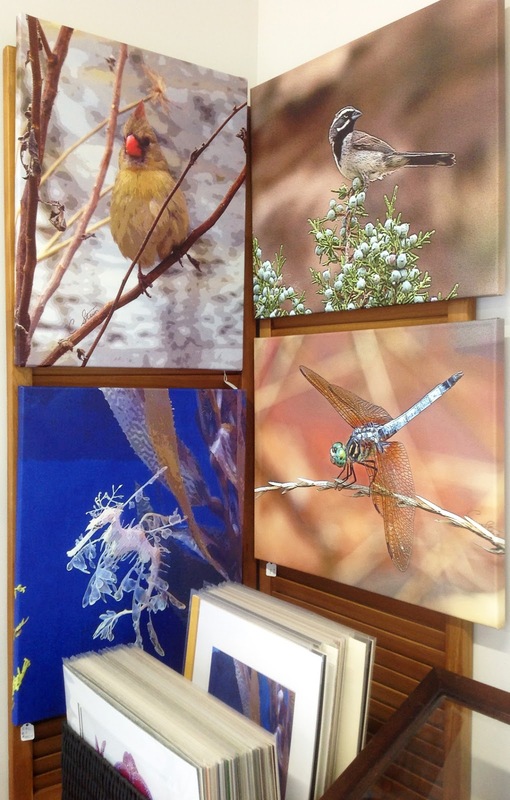 My artwork will be back at BRIT in Sept. 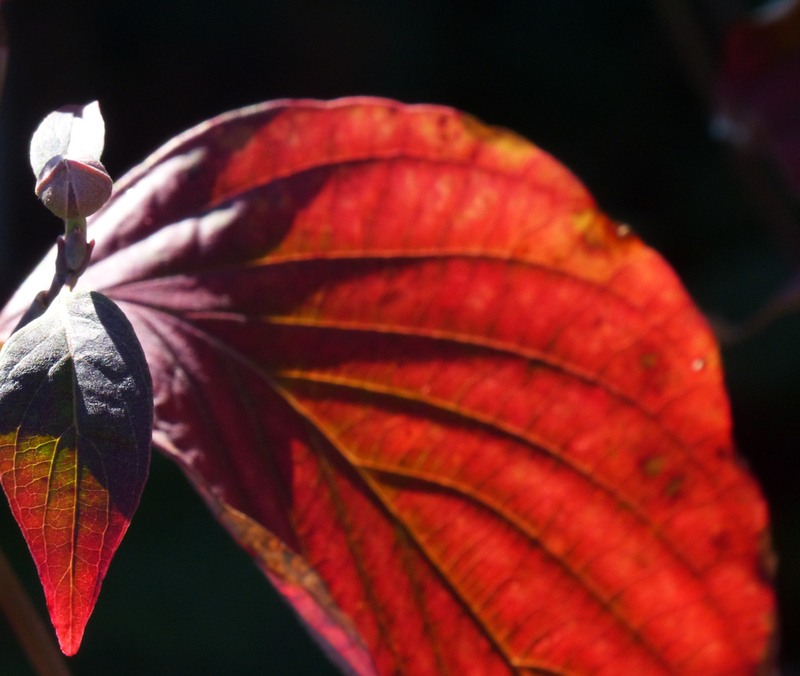 Instead of being part of a gallery exhibit as a few pieces were earlier this year, I will have a full compliment of my photographic art with me for an invitation only reception on Friday, September 7, 2018 and as part of FWADA Fall Gallery Night at BRIT on Saturday, September 8. BRIT will be open to the public on Sept. 8 from 4-9pm. You will find me and my artwork (matted prints, note cards, coasters, ready to hang artwork and more) along with about ten other artisans and their creations in atrium II as part of the pop-up artisan market. There will also be a new exhibit in their gallery space and welcome center as well a pop-up exhibit by the Fort Worth Art Collective. Until recently I thought muscat, muscadine and mustang all referred to the same type of wild grape. It turns out I was sorely mistaken. I helped a fellow resident pick wild grapes from my vines so she could make some ice cream from them for our city's ice cream social earlier this month. While she was was researching recipes she asked me if muscadine and mustang grapes were the same thing. At the time I thought so but based on the resources she found, I began to question if that was correct. While not part of our discussion, I thought I remembered muscat being used as a short version of muscadine and I decided I should look into that too. Mustang versus Muscadine: Both grapes are native to the Southern United States with quite a bit of overlap in their native ranges. Mustang grapes are purple as well as some varieties of muscadine. Both grapes mature into large vines that climb trees or any other object near them and are drought tolerant and have low chilling requirements. There are noticeable differences between them however. Mustang grapes mature earlier. They are much more acidic. When I eat fresh mustang grapes off the vine, I squirt the gelatinous inner flesh into my mouth and discard the skins because of the reaction I had from eating the whole grape. 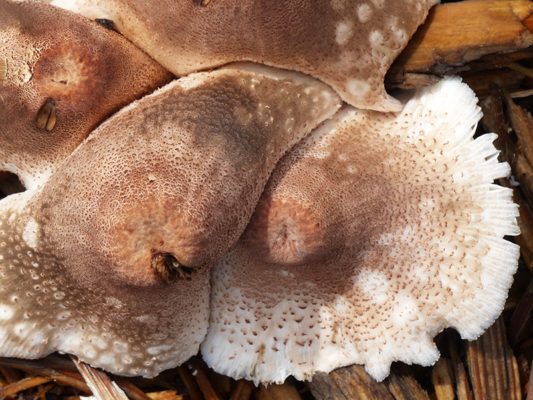 The skins have a complex flavor when cooked however and contain a lot of pectin. The ice cream my friend made from the cooked skins was yummy. And beware, neither type is seedless. 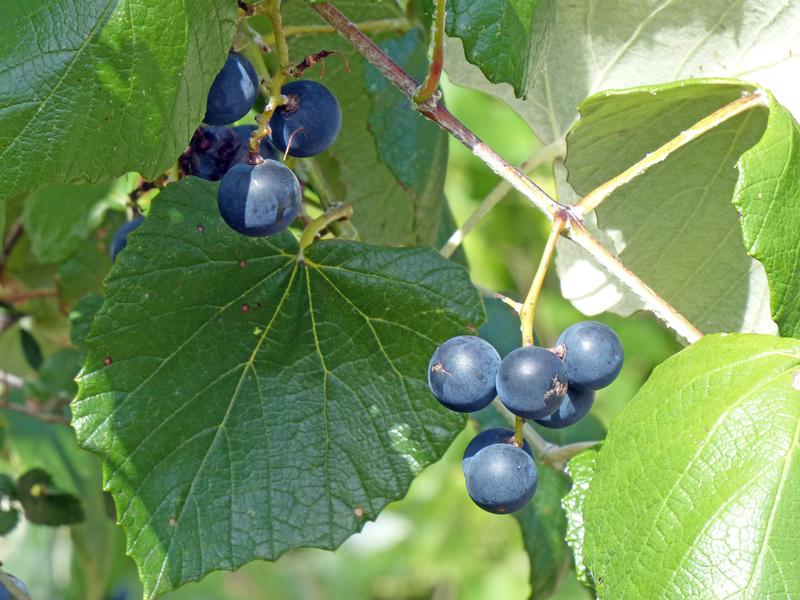 Compared to mustang grapes, muscadine grapes are sweet. 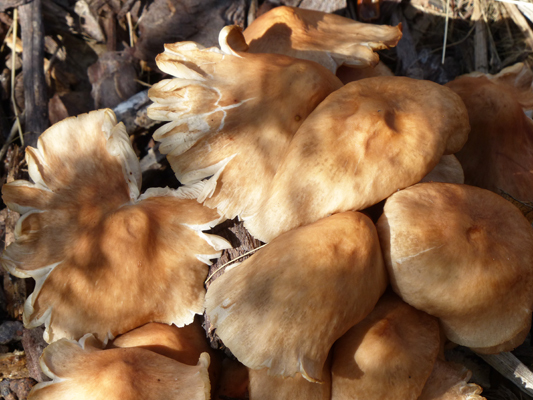 They are used to make wine, jams and jellies. Mustang grapes can also be used in the same way, however the flavor profiles are very different. You can also tell the two grapes apart from their leaves. Mustang leaves are fuzzy on both sides and the bottom of their leaves are whitish. 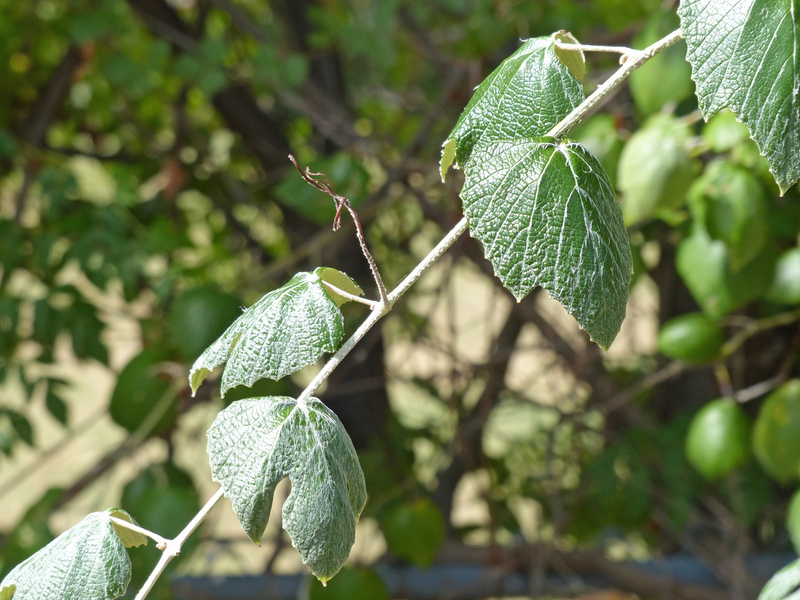 Muscadine leaves have little or no fuzziness. The first photo in this post is of a young section of mustang vine when the leaves are fuzziest and often three lobed. 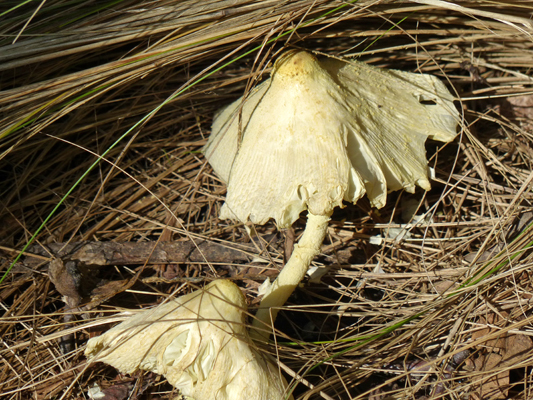 As they mature the leaves lose some fuzziness and their lobes as seen in the second photo along with some ripe fruit. As for muscat grapes. They are an old world family of grapes not to be confused with our native North American muscadine and mustang grapes. 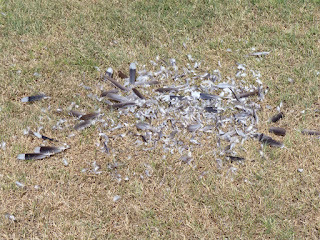 As I drove past our park today I noticed a large, scattered pile of bird feathers. 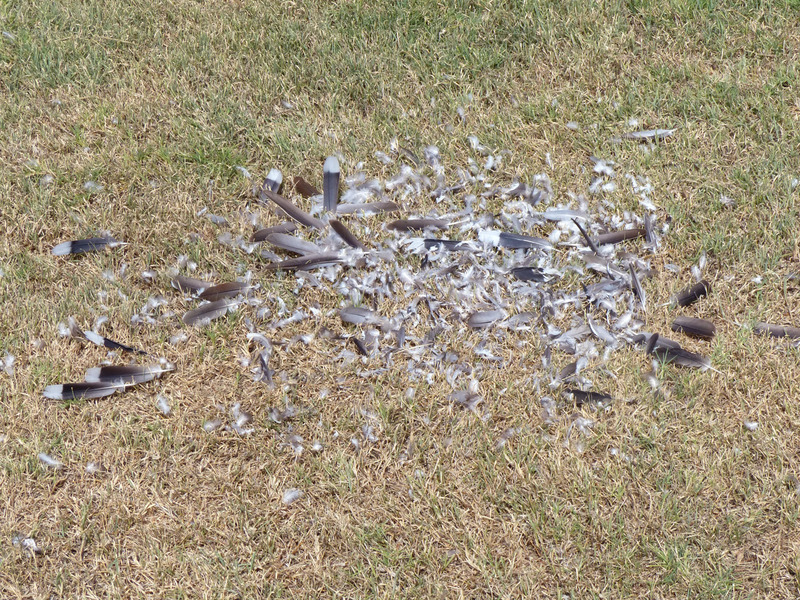 I recognized I was looking at the aftermath of a recent raptor kill. Several years ago upon turning down our driveway we saw a Cooper's hawk with a fresh kill and watched while it plucked and then flew away with the bird it had dispatched. all three, I feel confident that the bird feathers are from a white-winged dove. As for the raptor, there are four hawks that I have seen in Dalworthington Gardens who prey on birds. The largest, the red-tailed hawk, is known for catching rodents and other small mammals more than birds so I think this one is not the most likely hunter. The other three hawks are red-shouldered hawk, sharp-shinned hawk and Cooper's hawk. 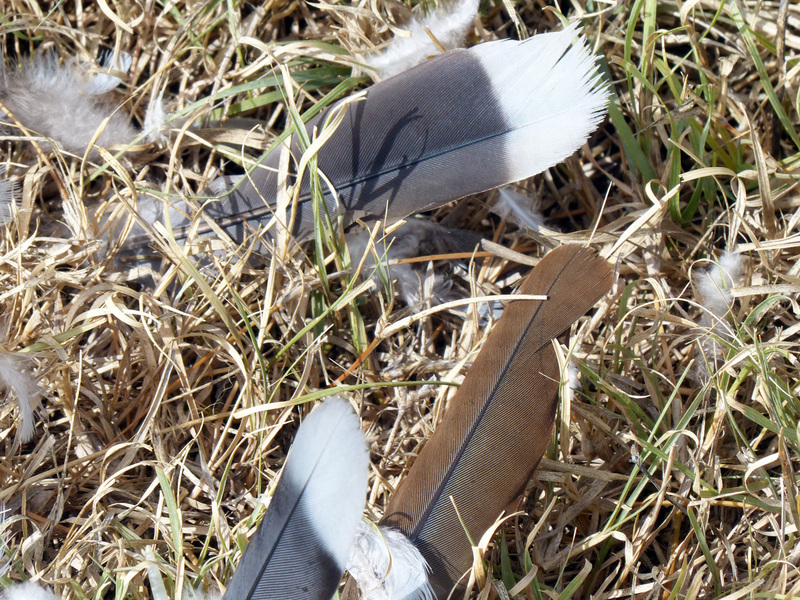 I have seen a dove explode out of a hedge row with a small hawk on its tail. They were moving so fast and I am not quick to ID the smaller hawks so I do not know which of the three that was but I am guessing one of them was responsible for the pile of feathers I spied today. The Audubon distribution maps put sharp-shinned hawks further north for breeding season and birds seem to be a smaller part of a red-shouldered hawk's diet than the other two, so I am going to guess the hunter was a Cooper's hawk like I saw in my driveway several years ago. A couple of nights ago I was helping a friend pick some of my muscadine grapes when all of a sudden I realized that what I thought was a tangle of vines and branches was actually a bird's nest and it was occupied by an intact egg. 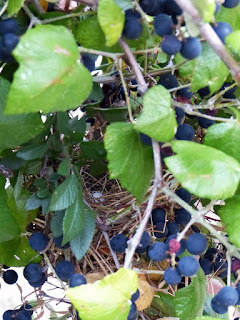 I had been clipping grape clusters below the tangle but stopped as soon as I discovered the nest. 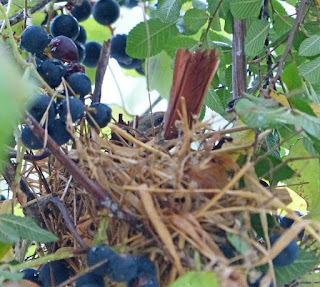 I did not want to through off the balance of the nest by lightening the vines by removing grapes. 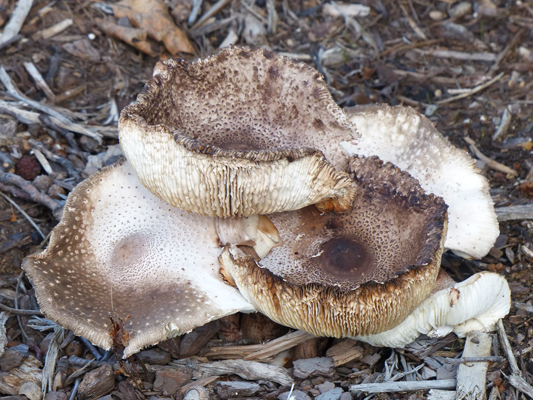 They were also offering important cloaking for the nest. I did get a couple of pictures before moving my ladder to another section of the wild grape vines to continue harvesting. determine that the nest was abandoned and the egg was not viable. With the exception of a few officially designated pest bird species, all bird nests and eggs are protected by federal law in the form of the Migratory Bird Treaty Act. In addition some states, counties and communities have additional protections on the books. 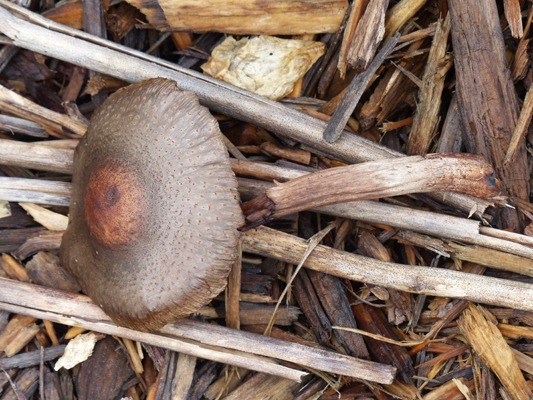 Texas Parks and Wildlife has some good information about what to do if you encounter what you think might be abandoned wildlife. 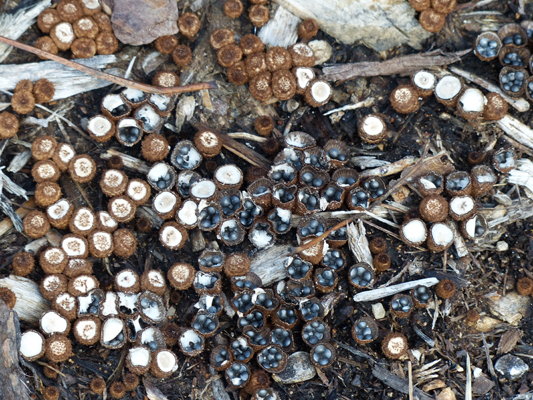 Numbers seven and ten in this link have some additional good suggestions regarding discovered nests. I am not well versed in egg identification. If by chance these pictures give you a hint as to what type of bird laid this egg, please let me know in comments. Clicking on the images will bring up larger versions. 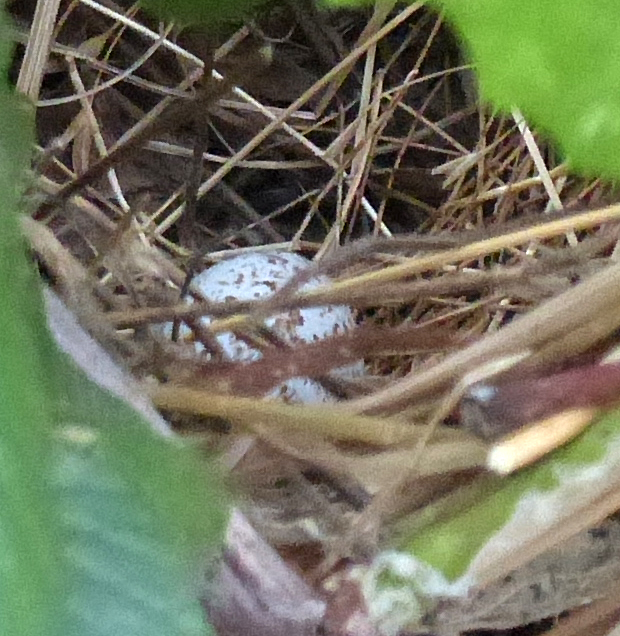 Update 7/11/18: It's a cardinal nest! I snapped this picture last night. I went to get the mail last night, looked up and saw the female's tail feathers showing so I got my camera and took some photos from the driveway. I did not want to drag out a ladder and scare mama off. 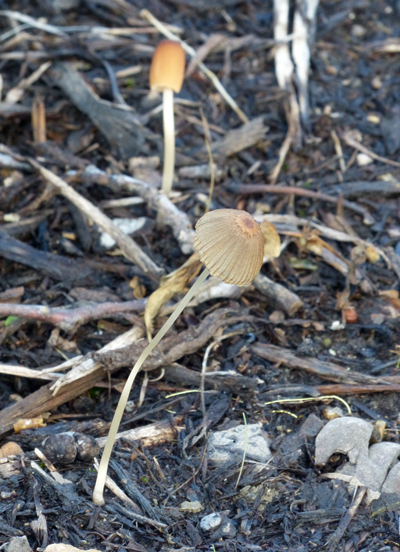 I did not notice I had more than tail feathers in the shot until looking at them on my monitor.